This position is applicable to any postgraduate nutritionist/dietitian who is currently studying (and due to finish within the next few months) or has recently graduated from an MSc or another Postgraduate programme. The successful applicant will work closely with the Mac-Nutrition team on external contracts, in-house projects, the provision of MNU and our continual professional development mentoring platform. The role is designed to give a hard-working, dedicated, postgraduate qualified individual a supported and structured route to becoming a sought-after nutrition specialist and ultimately gain full-time employment as an integral part of the team at the end of the 6-month internship. The right candidate must be passionate enough about nutrition to be willing to spend time outside of allocated working hours dedicated to reading research and articles, listening to podcasts and developing their professional practice via our Fast-track Internship Programme*. 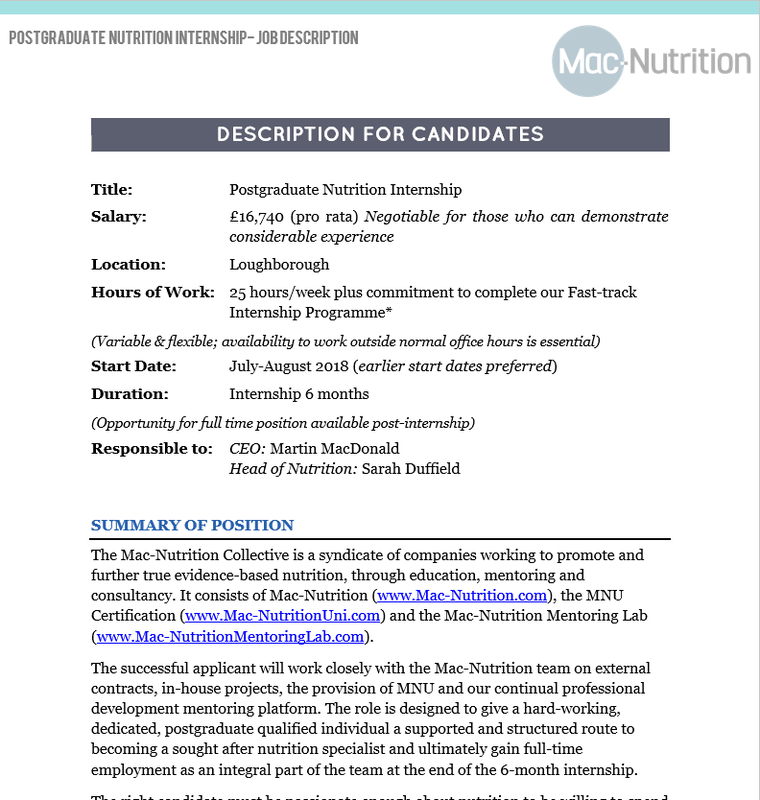 Applicants must have a desire to work under the Mac-Nutrition brand and to diligently and faithfully act as a promoter of the company’s philosophies.